After over 60 years' development, China has become the largest production base of pesticides in the world, with over one third of its output exporting to over 160 countries and regions every year. China’s pesticide industry has made great progress during the past few years. The number of up-scale formulators reached 822. China can produce over 500 pesticide technical with over 3,000 pesticide formulations. Adama, Nutrichem, Rainbow, Red Sun, Wynca, Yangnong are among the top 20 pesticide companies in the world. The output of pesticides hit a historic high, reaching 3.8 million tonnes in 2016. China is playing a more and more important role in the world pesticide market, as China mainly produces generic products in the form of technical, and over 70% of the global demand of pesticide technical is produced in China. Therefore, China’s pesticide industry is deeply influenced by the world economy. The development of China’s pesticide industry slowed down in 2015 with the export value declining by 14.4% compared to that in 2014, influenced by the worldwide economic downturn. In 2015, the price of some bulk commodities such as grains, crude oil, natural gas, coal, iron ores, decreased drastically to different extent. And the global pesticide market value witnessed the maximum drawdown in the past ten years. China’s pesticide industry developed steadily in 2016 along with the recovery of world economy. The Chinese government is now actively strengthening the pesticide industry by releasing stricter policies for environmental protection, raising threshold, phasing out highly toxic pesticides and pesticides with high residue level, etc. and has been strengthening the inspections of environmental protection. Some pesticides have been banned for use by the Chinese government these years. Some companies who can’t reach the standard were ordered to close down, and the production of some pesticides that can’t reach the standard was ordered to stop. Also the Chinese government is planning to realize zero growth in the use of pesticide by 2020. In a circumstance of depressing global economy, some pesticides have shown downtrend in supply and demand these years. With policy pressure from the Chinese government, lots of pesticide producers, especially those small ones, have been trapped in an embarrassing situation. 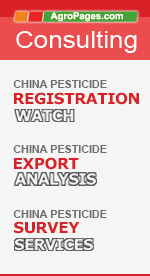 Then how does the market of each major pesticide in China develop? In order to figure out China's pesticide market clearly, CCM selected 18 major pesticides (including 6 herbicides, 6 fungicides and 6 insecticides) to conduct in-depth research. This report studies the current pesticide industry and forecasts the market by the end of 2021. This report is based on data collected via diverse sources. The primary sources include interviews with key pesticide producers and traders. Various secondary sources include published magazines, journals, government statistics and databases, etc. Data obtained from various sources have been combined and cross-checked to ensure that this report is as accurate and methodologically sound as possible. Time scope: 2012 to H1 2017, primarily 2016 to H1 2017. On the basis of industrial segments: production, technology, price, consumption. Table 6.1-1 Basic info of Nanjing Red Sun Co., Ltd.
Table 6.2-1 Basic info of Zhejiang Wynca Chemical Industry Group Co., Ltd.
Table 6.22-1 Basic info of Limin Chemical Co., Ltd.
Table 6.23-1 Basic info of Jiangsu Sevencontinent Green Chemical Co., Ltd.